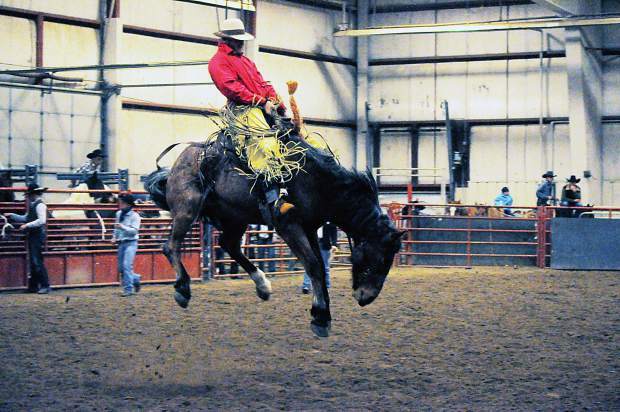 The Bronc Bash horses and riders entertained the crowd in Torrington. Picture this: 35 cowboys and cowgirls cling to hairy, fresh, saddled broncs as they bust out of the orange chutes in the Goshen County Indoor Arena in Torrington, Wyoming. This was the experience for the more than 500 spectators who gathered for the 2016 Western States Ranch Rodeo Association (WSRRA) Bronc Riding Bash Jan. 8. The Second Annual Bronc Bash was put on by Naomi Loomis, 2015 WSRRA Producer of the Year and manager of Double A Feeds, in Bridgeport, Nebraska. "I like to give the kids an opportunity to ride horses in the middle of the winter," Loomis said. "It's just a good family event, and everyone gets a bit of cabin fever. 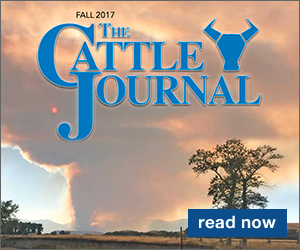 I don't know anyone who doesn't like bucking horses and the arena is heated and that makes for a perfect match." 8 Seconds Whiskey, a National WSRRA Sponsor, chose the event to be a high point event. Points are sought after to qualify the top 15 point-earning bronc riders for the WSRRA Finals. "8 Seconds picks an event that is a high profile event and they assign 40 points to the first place bronc ride," Loomis said. The average Western States Ranch Rodeo awards 10 points to the first place rider. Participants paid $150 to enter the event, some of which went back into the $5,000 prize money. Sponsors completed the remainder of the prize money, as well as covered other fees involved with hosting the event. Eight Wheatland, Wyoming businesses pooled together to pay the four pickup men. Loomis said, "It's really hard to get sponsors, so I'm that much more appreciative. For example, if I didn't have those Wheatland sponsors, I would have $800 in pickup man fees." In addition to money, the top five in the short go earned prizes sponsored by Chaz Mitchell Custom Hatz, Newcastle, Utah; Horny Toad Saddlery, Hyannis, Nebraska; Cow Camp Saddlery, Lusk, Wyoming; and Flat Top Rags, Loveland, Colorado. The top 10 from the long go were slated to qualify for the short go, though tied scores dictated that 12 cowboys qualified. Lane Stevenson, Bosler, Wyoming, and Wesley Rosengreen, Wheatland, tied for first in the short round. Cheyenne Seymour, Rozet, Wyoming, snatched second. Andy Sherfey, Lisco, Nebraska, and Mike Birkmaier, Buffalo, Wyoming, tied for third place. 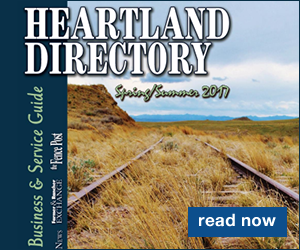 Alex Burham, of Saco, Montana; Tanner Solberg, of Richland, Montana; and Justin Harvey, of McFaden, Wyoming, compiled fourth place. In fifth place, Justin Quint, Akron, Colorado; Chris Laucomer, Scottsbluff, Nebraska; Colton Vega, Pollock, South Dakota; and Brandon Bowers, Sheridan, Wyoming, snuck into the finals. Once in the short go, cowboys rode their broncs for a new score and placing. Points from both rounds were not cumulative, and the short go placing was solely on their second ride. Between rounds, the top 12 cowboys were auctioned off in a calcutta garnering more than $3,000. 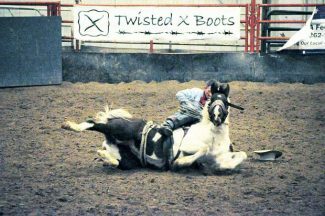 Sixty percent of the calcutta went to the buyer of the first place bronc rider, and forty went to the buyer of the second place rider. The placings for the short go are as follows: first, Quint on Pokey of the Bad Medicine Rodeo Stock; second, Solberg on Poppy of Selle Rodeo Productions; third, Rosengreeen on Ruby from the Bad Medicine Rodeo Stock; fourth, Stevenson on Plain Jane of the Bad Medicine Rodeo Stock and Harvey on Spur Dog of Selle Rodeo Productions and Laucomer on Penelope of Selle Rodeo Productions; fifth, Birkmaier on Rosa May of Selle Rodeo Productions. Rosengreen said he enjoyed the Bronc Bash. "When Naomi puts an event on they're alway good. She has great prizes and overall the broncs all bucked good," he said. "Most of the guys [who competed] I know and I'm friends with, so that was fun. They didn't make [winning third] easy." Bad Medicine Rodeo Stock and Selle Rodeo Productions provided bucking horses for the long and short rounds, and H&H Rodeo Company and Summit Pro Rodeo Broncs provided stock for the long go. Wayne Larsen of Bad Medicine Rodeo Company said "We were pleased with our horses especially for this time of year where our horses have been turned out on grass for a few months. Our last rodeo was the last part of October-first part of November. 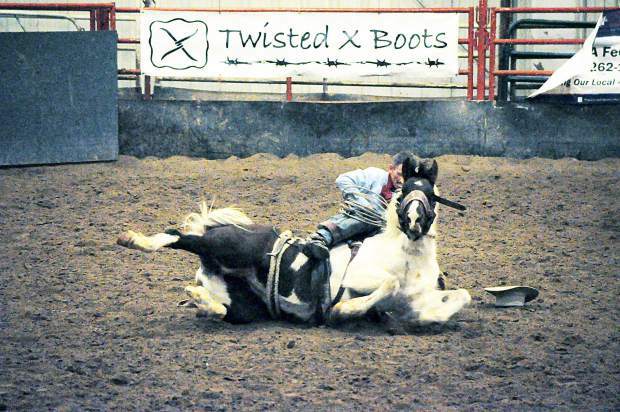 It was a good crew and went fast for as many horses as we bucked." Rand Selle, of Selle Rodeo Productions agreed that success was had. "I think everyone was happy with the caliber of horses they got on there," Selle said. 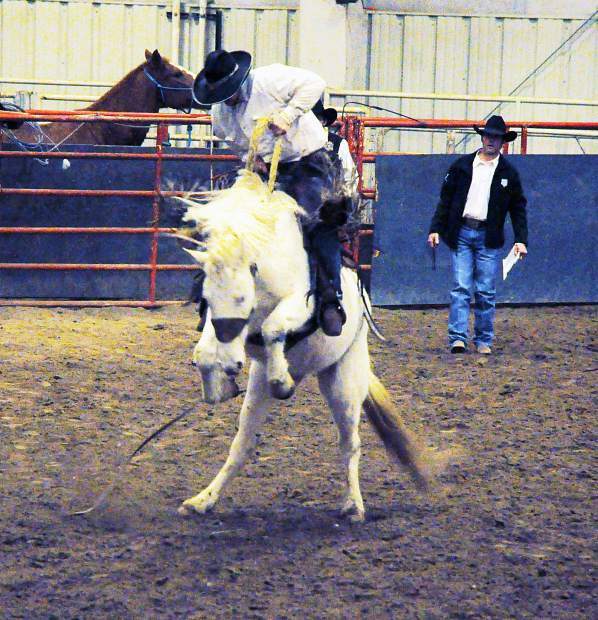 "I actually competed in it and one of JD Hamaker's horses bucked me down pretty fast." Selle supplied 10 of the 55 broncs from the event. Hamacker makes up half of H&H Rodeo Company. One of Selle's broncs that was in the eliminator pen, or short go, is named Chaz Mitchell Custom Hatz. This is no coincidence. "It's a big sorrel with strip on its face and four white socks; real flashy horse," Selle said. "Chaz is one of my best friends and for him being so good and donating hats, I figured I would name a horse after him so when that horse came out he would get recognition for his donations." Down time during score tallying was filled by last year's Bronc Riding Bash winner Matt Robertson, of Tomahawk, Canada. Robertson returned to event, sponsored by Gumbo Lilies and Frasch Trucking, to sing and play his guitar. He is originally from Wheatland. "Matt came back and isn't riding broncs, but is working on his music career," Loomis said. "It's pretty exciting because he's a new kid and his career is definitely picking up." Loomis said the event was great overall. "The crowd and help were awesome, and all the cowboys were great," Loomis said, "That's what it takes to put on an event of that size. Thank you to everyone for braving the cold."